The fastest, most accurate, reliable, easy-to-use handheld water quality analysis tool for any pool or spa. 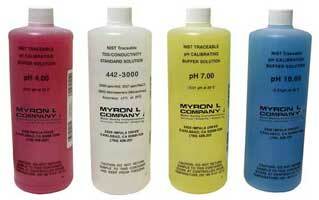 Since 1957 the Myron L® Company has designed and manufactured highly reliable analytical instruments for a wide variety of demanding applications. Thousands of professionals around the world rely on the performance of our instruments every day. Uses range from boiler water testing to ultrapure water control to medical instruments for artificial kidney machines. We are proud of the trust our handheld instruments and monitor/controllers have earned. We have continued to build on that trust and have reached a new and greater level of quality and performance in the latest instrument in our line of handheld tools: PoolPro gives you the most reliable, precise, affordable, multi-parameter instrument available for testing water quality in any pool or spa. PoolPro is a comprehensive high performance tool designed to simplify pool and spa water quality control for the pool professional. Both PoolPro models feature innovative user-friendly features and functions that make it easy to manage parameters critical to disinfection, water balance, system maintenance and compliance. The Myron L® Company FCE function reports FAC quickly and accurately by measuring ORP, the chemical characteristic of chlorine that directly reflects its effectivity, cross referenced with pH. Both DPD kits and colorimeters may tell the user the FAC value of the sample in the test tube, but since the chemistry of that sample is quite different from the source water being analyzed, the results are imprecisely related to actual disinfection power. The Myron L® Company FCE function measures the real, unaltered chemistry of source water, including moment-to-moment changes in that chemistry. FCE can be used for other types of oxidizing germicides and will track the effect of additives, such as cyanuric acid, that degrade chlorine effectivity without changing the actual concentration of free available chlorine present. The PS9TK adds the ability to perform in-cell conductometric titrations that provides a convenient way to determine alkalinity, hardness and LSI in the field. This eliminates the need to collect and transport samples to another location for analysis. User intuitive display prompts guide you through titration procedures from start to finish. 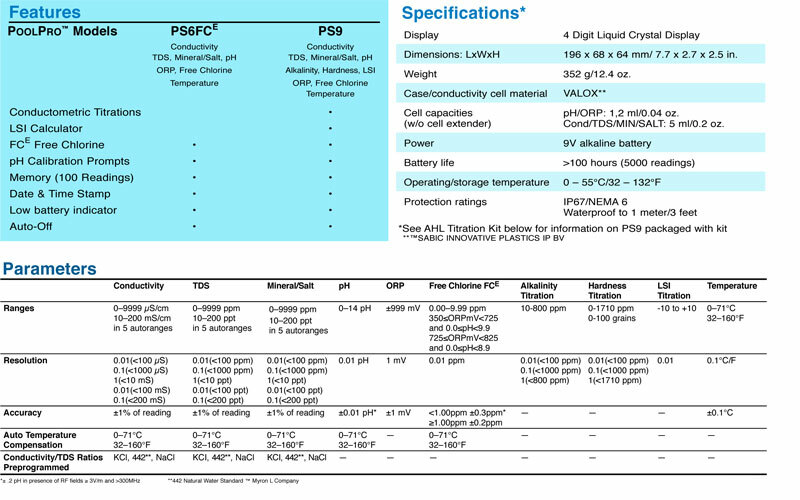 All required reagents and equipment are included in the PS9 titration kit. The PS9TK features both an LSI Calculator and an LSI Titration measurement mode. The Calculator allows you to perform what-if scenarios to predict how changes in solution parameters would affect the water balance of a system. The titration measurement function allows you to accurately calculate a saturation index value of a specific solution to determine whether the solution is balanced, scaling or corrosive. The Hardness and LSI Titrations and LSI Calculator functions allow you to set the hardness unit preference to either grains of hardness or ppm CaCO3 according to your needs. Myron L®’s PoolPro provides a fast, precise, easy-to-use method of obtaining Oxidation Reduction Potential (ORP or REDOX) mV readings to check the true level of effectiveness of all sanitizers in any pool or spa. ORP objectively and precisely measures sanitizer ability to burn up, or oxidize, organic matter in the water. ORP can only be determined by an electronic instrument. PoolPro ORP mV readings serve as a necessary check to ensure automatic ORP control systems are working properly. PoolPro also provides independent readings for recalibration and to detect system failure. PoolPro provides a convenient one-touch test for Mineral/Salt concentration. This is ideal for saltwater systems where manual testing with separate instrumentation is necessary to ensure the proper amount of sodium chloride is present for chlorine generation in quantities specified for microbial disinfection. PoolPro can also be used to recalibrate equipment as part of regular maintenance. The optional bluDock™ accessory package is an integrated data solution for your record keeping requirements, eliminating the need for additional hardware, wires and hassle. Because the user never touches the data, there is little opportunity for data tampering and human error. bluDock software has an easy to use interface with user intuitive functions for storing, sorting and exporting data. PoolPro is lightweight, portable, buoyant, waterproof, easy-to-calibrate, and easy-to-use. Simply rinse and fill the cell cup by dipping the PoolPro in the water, then press the button of the parameter you wish to measure. You immediately get a standard, numerical digital readout — eliminating all subjectivity. And you can store up to 100 date-time-stamped readings in PoolPro’s non-volatile memory. Discounts granted with ordering 3 or more meters of the same type.